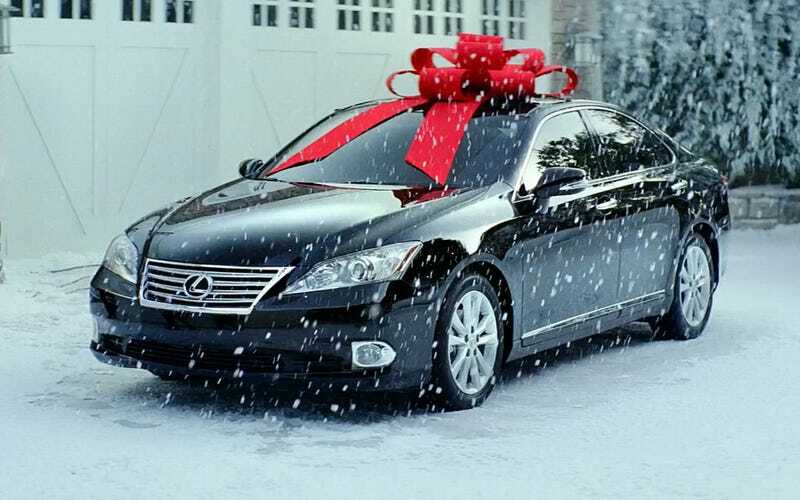 Should I Buy My Kid A Car For Christmas? Many parents are often torn between giving their children more than they themselves had, but also not raising them to be spoiled and expects things. This dilemma can get especially difficult when it comes to helping your kid get their first car. Welcome to Ask Automatch! Where you get to ask me your burning car buying questions. Got a scenario or a situation and you aren’t sure what to do? Send an email to Tom.McParland@jalopnik.com and I’ll try to help you out. This week’s letter comes from Ryan whose teenage son just got his license. Ryan agrees that it’s time for junior to get a car but is worried that a gift won’t foster responsibility. My son just recently got his license and naturally, has been asking for a car. He is is a good kid who does well in school and loves cars just like his dad. The problem is he doesn’t have much money to buy a car on his own. Most of his summer job savings is put aside for college. Between academics and extracurricular activities, it doesn’t leave him much time during the school year to work. He could probably scrounge up two or three grand for a cheap ride, but I would rather see him in something a little newer and in better shape. A relative is selling her 2008 Impala with low miles for around $8000. I think this would be a better choice since it can probably last him through college and beyond. So I would like to buy it for him as a Christmas gift. However, people keep telling me that if you gift your kids cars they won’t learn what it’s like to be responsible and save for a major purchase. Should I have him buy something on his own or pitch in for this car? Can you give a kid a car without making them entitled? Also, how do you feel about those “big brother” devices for teens that cap their speed and track their driving data? Ryan, you know your kid best, and if he’s the type to appreciate this gift and use it as an opportunity to become more mature and responsible, don’t second guess your generosity in giving your kid a car. Many parents gift their cars to their kids, and you are correct that a well maintained $8,000 Impala bought from a family member is probably going last a bit longer than a cheap beater from some random person. Since your son has already done the smart thing and socked some money away for college, I don’t really see the need for him to kick in a few grand for this gift. Furthermore, even if the car is free there are plenty of ways your son will have to step up and be more responsible. One thing you could do is insist he pay for gas. People need to see that $20 in their wallet and decide whether or not they will fill the tank or spend it on something else. The other thing that people should learn is basic maintenance. It boggles my mind how many kids are driving and don’t even know how to change a tire. They don’t need to know how to rebuild a transmission, though it’s cool if they do, but they should know how to change their oil or at least know how to check it properly. Novice drivers should also know when their tires need replacing and how to spot worn out parts before they become a problem. Insurance is another cost he could contribute to and with a young driver in the house that can be pricey, so any assistance you can get on that front will help. While we are on the topic of insurance costs and risky teenage drivers. I have no qualms with installing one of those devices that enables you to limit the car’s speed and track driving behavior. The statistics about teen driving deaths alone are staggering. One thing I highly recommend is signing your son up for one of those behind the wheel teen driving courses. It will cost you a few hundred bucks to have them practice emergency maneuvers, and defensive driving could prevent an accident. Your insurance company might even give you a discount. Even if you were one of these wealthy parents that bought their kid a brand new car, a kid can still learn to be responsible through a combination of education and clear expectations. Can A Dealer Lie To Me About My Credit Score? Should I Spend $30,000 On A Car Or An Airplane?